Reginald’s father had been born in Fulton, Yorkshire in 1849, but moved to Central London where he met and married Annie Woodward, a local Bishopsgate’s girl, in Islington in 1874. The couple appear to have moved down to Beckenham in Kent, where Frederick was working as a warehouseman in 1881. Here they brought up the first of their 8 children – Annie, Louisa & Frederick – who were born in quick succession between 1876-78. By 1891, the family were back in London, living in Ball Court, Farringdon, with Frederick now employed as a ‘Packers Foreman’. The family had expanded too, with sons Edward, Henry, William and Charles all added to the Potts household. Eldest daughter Agnes (Annie) was, at the age of 16, already out at work as a ‘mantle maker’. Reginald was born in 1892, the youngest & final member of the family. As time passed, the Potts’ household moved again, this time to St John’s Street in Finsbury. By 1901, Frederick & Annie were already grandparents, with Louisa & her 3-year-old son Lionel living in the family home. Eldest son Edward, now 19, was working as a clerk in a company dealing with china and glass, while William too was out at work, aged 16. But while this clearly industrious family strove to keep themselves fully employed in what must have been challenging times, what of our future Saracen, Reginald Potts? 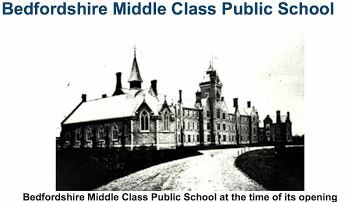 1901 found the young Reginald not at home in London, but at the County School – a residential boarding school in Bedford, formerly known as the Bedfordshire Middle Class Public School from its foundation in 1870. His attendance at such a prestigious and stimulating establishment was entirely due to the generosity of his elder sister, Annie, who had just achieved acclaim and success as an actress on the stage in London. 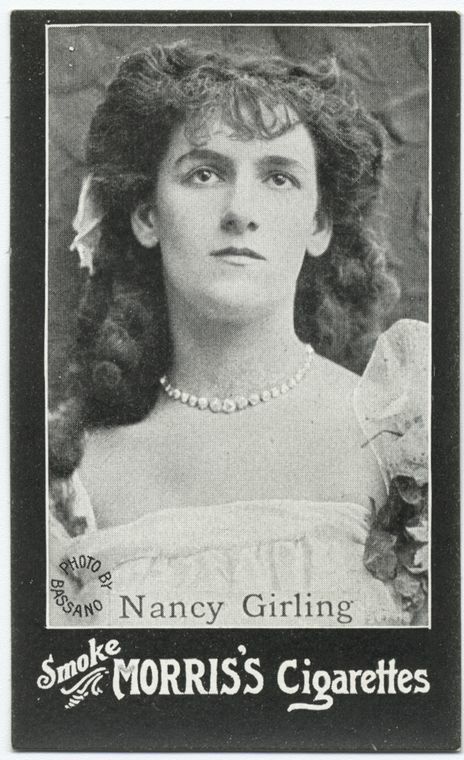 Adopting the professional pseudonym of Nancy Girling, she shot to fame in 1899 as one of the founding players in the storming musical comedy success “Florodora“, which ran for 455 performances. Her fame was assured when she was selected as one of the featured actresses of the era celebrated in the Morris’s cigarette card collection. Thanks to her support, it is clear that the environment was to nurture and encourage Pott’s natural sporting abilities. Set in 22 acres of grounds, the school during Reginald’s years was under the ownership and management of the Rev. Charles Farrar, who had taken over in 1898. Farrar immediately set about improving the essential ingredients of any Victorian Public school – he built a new cricket pavilion,improved the chapel and set up a School Corps in 1900, which became part of the Officer Training Corps in 1907. The school was very keen on sport, and especially cricket, and regularly had its batting and bowling averages published in the Wisden Cricketers Almanacs of the period. 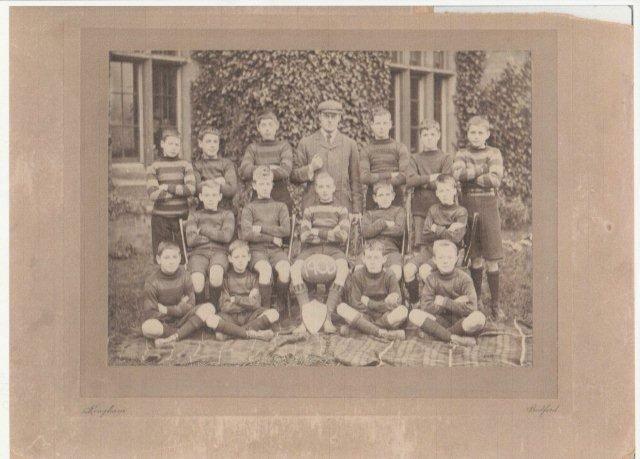 Young Reginald seems to have made his mark in Bedford at a very young age, as can be seen from this photo of the 1906 (now renamed) Elstow School 1st XV, where he sits proudly in the front row, aged just 11 years old. But it was in the emerging sport of Gymnastics that the Potts family were to truly excel in the coming years, rather than with bat or ball. The first Gymnastics Club in the UK had been opened in 1860 by German immigrants inspired by the pioneering work of the sport’s founder, Friedrich Ludwig Jahn, who had used the disciplines of the sport to improve the health and fitness of Prussian soldiers. The ‘German Gymnasium’ had opened in St Pancras, London, in 1865, and the British Amateur Gymnastics Association was formed in 1888, when Edward Potts was 6 years old and a few years before the birth of his youngest sibling, Reginald. By the turn of the century, and with Reginald already at Elstow Public School, the UK had already established its national championships and had competed in its first international event. How these two brothers came to participate in the sport, and go on to achieve so much success, is not yet fully clear – but they were, without doubt, exceptional gymnasts for their time in what was a rapidly emerging sports phenomenon. Sadly, the boys’ father, Frederick, was not to be granted the pleasure of seeing his sons’ achievements, as he died at the age of 55 in 1905. 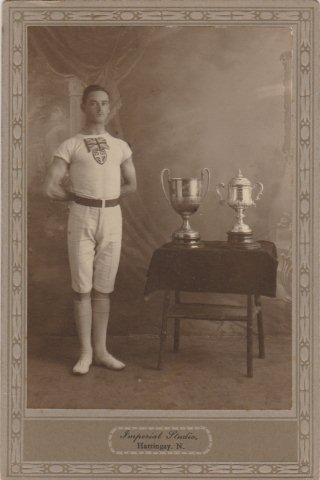 Despite this considerable setback, Edward enjoyed prominence and success, winning not only the German Gymnastic Society Open Championship in 1907, 1908 and 1909, but also being selected for the British Summer Olympics team in the London games of 1908 – a tremendous achievement and honour – where he excelled in the individual event, and finished 9th overall. Ten years his elder brother’s junior, we know that Reginald, too, was active in sports at this time, joining Saracens to hone his rugby skills, but also, it appears, hard at work in the disciplines of the new ‘Swedish’ style of gymnastics developed by Per Henrik Ling, Clearly, the two sports were incompatible for an ambitious gymnast….Reginald’s daughter, Pam, remembers her father telling her that his ‘German Gymnastics Coach’ instructed him to give up rugby at Saracens, and focus on his gym training. Rugby’s loss was undoubtedly Great Britain gymnastics’ gain, as both brothers found themselves selected for the GB Gymnastics ‘Team All-Around’ competition for the 1912 Stockholm Olympic Games! Despite bringing the new Ling form of gymnastics to the world’s attention, the Swedes appeared somewhat unprepared for an Olympic-standard competition on this scale. The official Stockholm Olympic Games report highlights a number of unfortunate challenges faced by the Organising Committee, which drew adverse comment from some of the participants. Firstly, there was no building suitably large enough to hold the Gymnastics and so the events were scheduled for the centre of the main stadium. The sheer number of participants put pressure on changing room space, and the Riding School behind the stadium was pressed hastily into service. Some of the actual apparatus was not available in Sweden, and so was shipped in quickly from the gymnastics suppliers Dietrich & Hannach in Germany. None of this appears to have impressed some of the competitors, who “criticized this material in other respects too during the course of the Games“. None of these teething problems appear to have adversely impacted Reginald & Edward Potts & their 22 GB teammates. On Thursday 11th July 1912, the 24-strong team took their places in the stadium at 2:00pm, dressed in the Team GB uniform of “White jersey with short arms, and with Gr.Britain’s flag on breast; white knickerbockers; red belt; white stockings and shoes“. They had 60 minutes to complete their routines against the competing national teams of Italy, Luxembourg, Russia, Hungary and Germany in their quest for Olympic glory…. The ‘Team Competition II’ in which Reginald & Edward Potts competed was a regimented and disciplined display of controlled & synchronised movements, coupled with 3 or 4 team members simultaneously performing on the Rings, the Pommel Horse, the Parallel Bars and the Horizontal Bar. While these items of equipment and even their routines might be familiar to the modern spectator, it is unlikely that we would be excessively moved today by the sight of the gymnasts “Squatting and Lunging in Combination with Trunk Bending. 32 Movements in 128 Beats“, and still less by the “Deep Breathing Exercise – 8 Movements in 32 Beats“, for which the detailed instructions for the gymnasts and judges included “Raise arms slowly sidewards to height of shoulders, lift the chest and inhale through the nostrils“! Nevertheless, as the pictures illustrate, it must have been a grand and impressive sight to watch from the stadium stands, and in a sense could be seen as a forerunner to many of the subsequent Olympic Opening & Closing ceremonies, even to this day. It must have been a nervous wait for the Great Britain team, as the Italian team stepped into the stadium to close out the competition between 3:00pm and 4:00pm. But then, finally, the result was announced by the judges….Gold medal to Italy, silver to Hungary…..and Bronze to Team GB! Reginald Potts and his brother Edward were Olympic medallists! In the space of two short years, the 19-year-old Reginald Potts had gone from playing rugby at Saracens to ascending the Olympic podium in Stockholm. 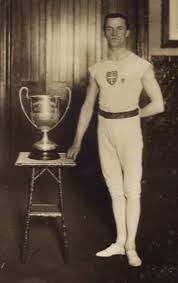 Unlike the Italian Olympic Champion Alberto Braglia, who used his fame to turn professional as an acrobat in a circus, Reginald Potts retained his amateur status and returned to his job as a Clerk at Lloyd’s Corporation in the City of London. Further challenges awaited him, especially upon the outbreak of war in 1914. My name is Sally Potts. I am Reginald’s grand daughter. I gave a sister, Dr Deborah Potts, a lecturer at King’s College in London. This story is, of course, absolutely fascinating to me. Is there any more?! Hi Sally, thanks very much for making contact! Please send me an email to saracensrugby@btinternet.com & I’ll be pleased to respond.